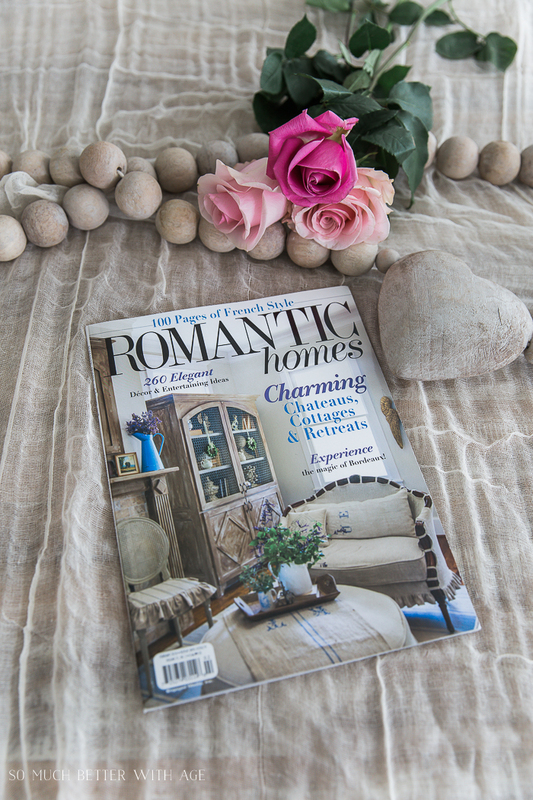 My home is featured in 10 pages of the February 2018 edition of Romantic Homes magazine. 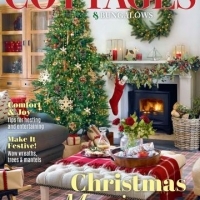 Also, my friend Anita from Cedar Hill Farmhouse is on the cover. Congratulations!! That is very exciting and well deserved. 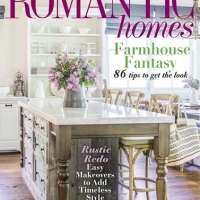 I haven’t subscribed to Romantic Homes for several years, but since Courtney has become Editor, it has vastly improved. Thank you! Isn’t the magazine amazing now? Congratulations Jamie, your home is so beautiful! I can’t wait to pick up a copy! 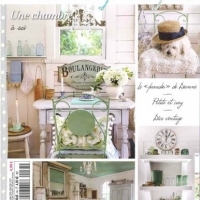 I also love Anita’s blog so it will be easy to find the magazine at the store! I do have one question, where did you get those amazing wooden beads with the wooden heart? There so pretty! Okay so I got the wooden prayer beads at the Rachel Ashwell store in Santa Monica but I’ve recently found them at a local store here in Vancouver called The Cross. You can google it but I’ll also leave an affiliate link in the post. Thanks for the reminder! I meant to add it to my post. Wow! What an honor. You should be so proud. Congratulations! I gotta look for it. 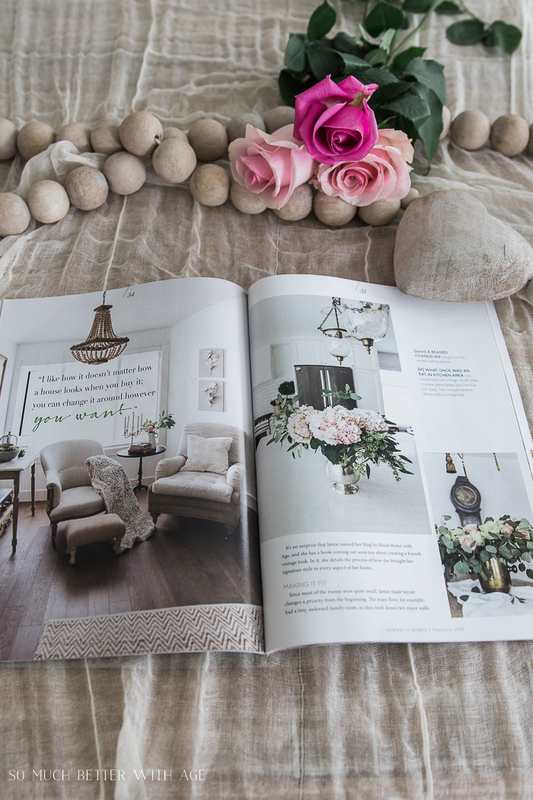 So excited to see the magazine and a great excuse to hunker down with a nice cup of tea on a Sunday afternoon! 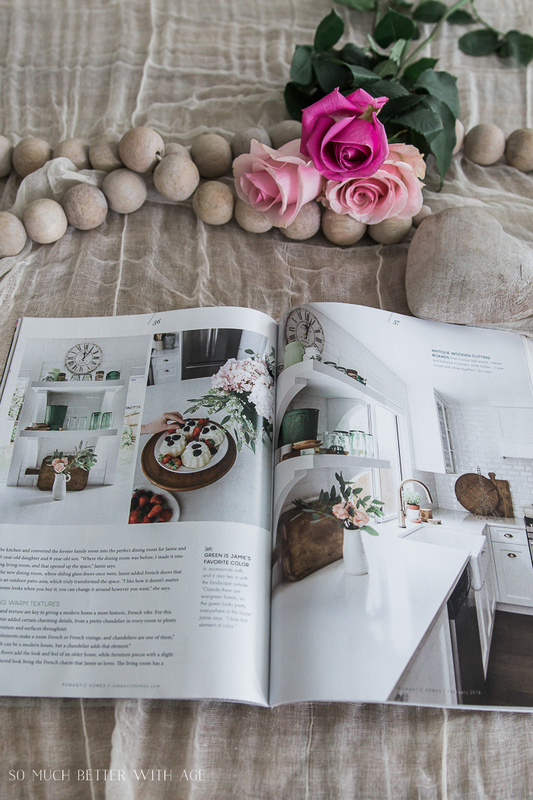 And am really looking forward to the High Tea shoot…my daughter and I are planning a shower in March for my niece and the theme is High Tea! I carry https://sloanetea.com/ in my store…fabulous tea! 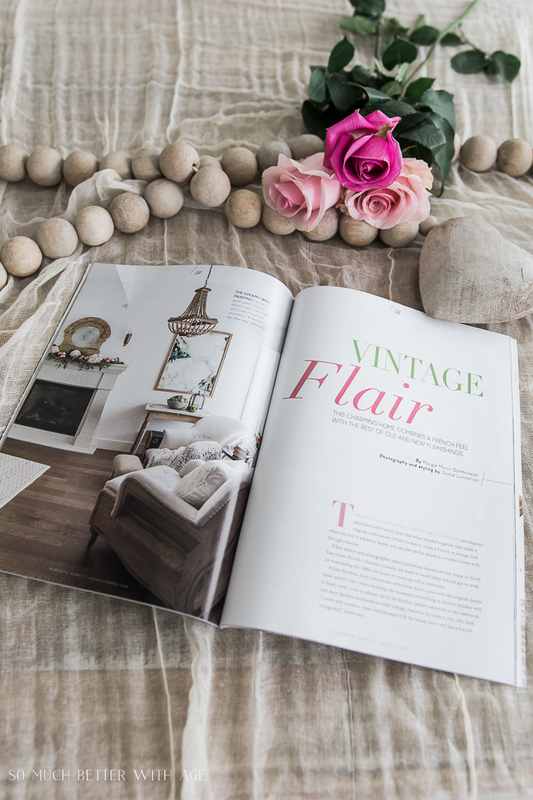 The Heavenly Cream is her signature blend and is probably what I will be enjoying as I peruse the magazine! Congratulations Jamie! Oh perfect! I’ve been taking photos all day and yesterday I made scones from the Empress hotel’s recipe. They are soooo good! I’ll be sharing the recipe on my blog Monday! I’ve seen that tea before and the tins are gorgeous! I love a creamy earl grey, is that what the heavenly cream is like? Let me know if you sell from your store. Tea & magazines are my favorite! Congratulations i am so pleased for you, you’ve worked hard. Aww, thank you Marlene! I love how you’ve been following me for so long. hey girl- congrats! can’t wait to get the mag! Do u know when it comes out? Hi Shawnna! I haven’t seen it yet here in Canada but that’s not surprising as it takes awhile but I’ve heard people buy it now in stores. ok- thanks Jamie – I’ll look for it tomorrow. I have my issue! Been a subscriber for Years! Congrats girl! That’s awesome! I have sooo many magazine subscriptions it’s becoming a problem. But I love them too much to stop! Thank you so much, Norma. 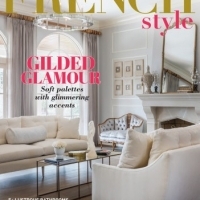 Congratulations, can’t wait to see the magazine! I’m so excited for you, and very proud of you. Your photos are so gorgeous. Can’t wait to see your book too. Just finishing the last bits of the second edition of mine, so I know the struggle. You have accomplished so much! Bravo. Aww, thanks Anita! It’s a lot of work, that’s for sure. Congratulations!!!! 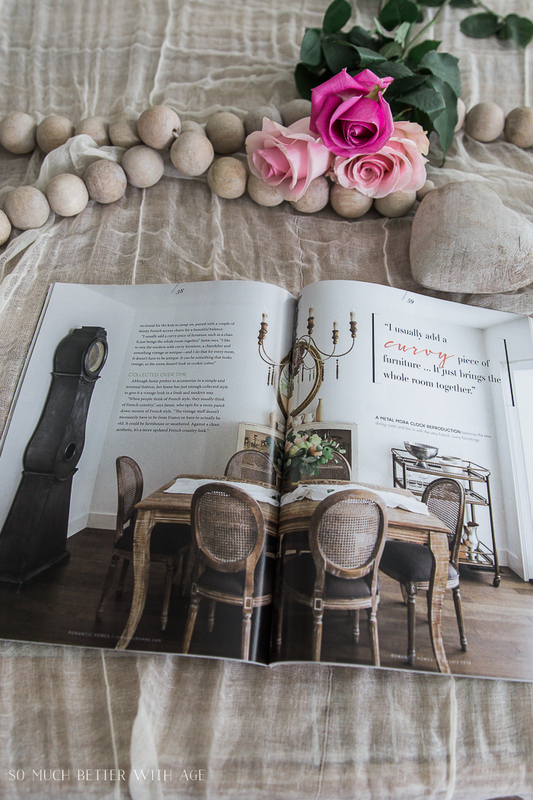 I love Romantic Homes…I am a magazine-aholic !!! I never get rid of one ! How exciting! Congratulations! I can’t even imagine…..I’ve followed you since almost the beginning and then when you moved into this current home, and what a transformation! I absolutely love your bedroom! A well deserved honor, your home is magnificent! If you don’t mind me asking, where do you find the natural large beads with the heart? I have looked and looked and haven’t had any luck, at all. Thank you! Thank you so much, Cathy for your sweet comment! I added a link to the prayer beads at the very bottom of this post now! 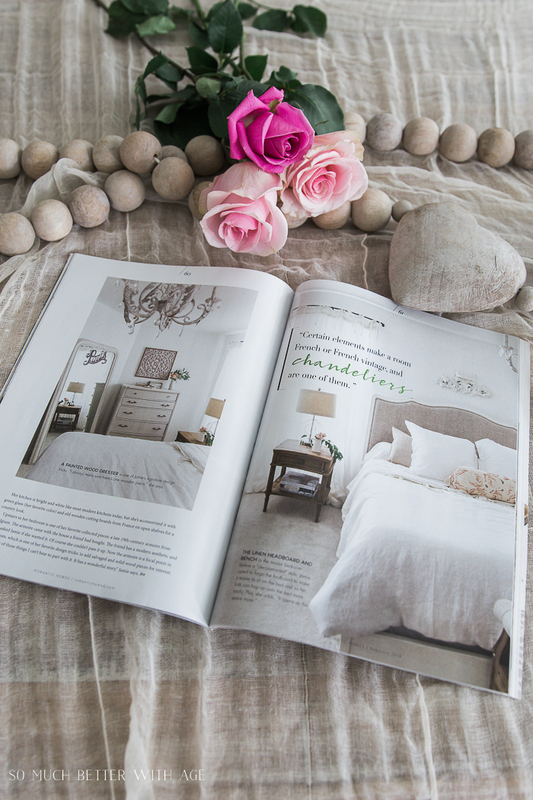 Congratulations on your home being featured, Jamie!!! How exciting! Your home is lovely. 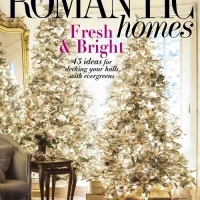 Funny, I’ve been collecting Romantic Homes magazines since it began, what?, 30 years ago? Something like that!!! I enjoyed your article and all of your photographs. Your hard work shows! Thank you so much, Barb! You must have the best collection ever!